“Whenever I have to make a presentation or speak in public I get so panicky that I even draw a blank as I start to plan it” Sound familiar? You’re in good company. Did you know that the number one fear of the American public — researched annually for the last 40 years — has been and still is any form of public speaking!It comes up as number one year after year. Amazing. Actually amazing to me because, since I was a small child, I was always glad to appear in public. To say my piece, play my tune, dance my dance, make my speech — all of it was not only easy and natural for me but also fun! So I have tremendous empathy for folks who find appearing in public to be terrifying and in my adult professional work I’ve not only continued to reach out, connect with and perform for the public but also to teach other people “how-to” — whether in the courtroom, the boardroom or the media. In an effort to understand why this fear is so rampant and widespread and to help solve it, I’ve studied all aspects of this panic to find out what creates it. And you know what? I’ve found the key ingredients! Understanding and demystifying them can help launch you on the path to erasing them. So let me share what I learned about how to help folks get over that panic, that stage fright and be able to stand up in public and give that smashing presentation, explain your ideas, and present yourself as you really are, to your best advantage. Stage fright is really based on a myth. Here it is: somewhere in the world there’s a way to deliver your speech with a perfect 10. You become obsessed with measuring yourself against that perfect “10,” thinking how far below that you’ll fall. This gives birth to an enormous case of “What if I fumble and lose my words?” ” I hate how I look,” “What will my boss (colleagues, clients) think of this — good? Smart? Well-conceived?” You can also add “My mother (father, teacher) always said I mumbled” and “I never liked making a show of myself” and there you’ve got it — Stage Fright! See — the energy and the focus is all about ME ME ME the speaker, not YOU YOU YOU the people being spoken to. Obsessing on you and your performance — what kind of grade you’ll get, how far off the markyou’ll be. But that’s not what presentations are about! They’re about giving your message to an audience! About explaining, persuading, supporting what information you want to get across to them. About how to make your audience listen. About helping them get your ideas and understand your points, not at all about you and how you’re doing. So let’s go to the source of this problem. How come so many people get stuck in this trap? Where does it come from? Adolescence — the real killer to self-confidence. Here we introduce the full-length mirror and all the “unacceptable” messages it gives us about our potential for success against our peers. And does the media ever have a field day with telling you how far short you’re falling from the ideal! All this does such a job on how you feel about displaying yourself in public for everyone’s perusal and grading! Adult Experience — Here’s where your professional and work experience begin to single out what’s admirable and what’s not, what works, who stands out and gets ahead and why. And you start comparing yourself — unrealistically — since you really have no idea how you come across to others. You can only use your own internal insecurities to grade yourself. And you also add some assumptions about how self-confident and competent others appear (though they may not feel that way at all, either!). This dramatically helps you slide up and down, mostly down, on that grade scale. And of course it continues your focus inward, onto you and how you’re doing, and away from outward — towards finding out whatothers care about and how to best tell them your ideas and help them understand you better. Funny thing is, this insight, this change of focus can get truly get you over stage fright because you’ll get so busy concentrating on capturing your audience, on making them get your message and thinking about the best ways to do that that you stop obsessing about yourself and what kind of grade you’re going to get. 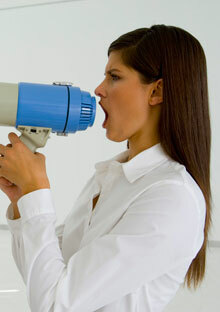 See — the true secret to being a great communicator is understand your audience. Know that people are motivated by self-interest and the key to reaching, persuading, capturing others is to reach out to their self-interest before you get yours met. So all the self-focus that is the essence of stage fright dooms you to failing in this key pursuit. That’s one of the major reasons to work on this — beyond the sheer business of getting comfortable so your best natural self can come through. Bottom line: Your sense of self is so often fashioned by illusions — by comparisons and wrong assumptions. And by what other people — and the media — have told you is good and admirable. You gotta drop all that and start focusing first on the job at hand when you present. Use your good head, your past experience and the knowledge you’ve gathered to attack your presentation from the audience’s point of view, not your own. What do they need from you? What have you to offer them? What do they already know and what do you need to fill in? What worries them? What’s tough in today’s world? Grab them with relevance and with energy, with the sense that they’ll miss something they can use if they don’t listen and stay tuned. And then think about what new interesting ways can you make your message clear. Attention getting. Compelling. And y’know what? Out the window goes the panic while you stay tight on grabbing and keeping them. Making them know that they need to hear you! In another blog I’m going to give you some great tips on what makes people listen today and some great techniques for being a charismatic presenter. But for now I hope you’ve gotten some insights into the heart of the matter and that they’ll help you start enjoying the sharing of your ideas and feelings with others. Everything about communicating with each other has changed since technology has taken over what used to be a live person-to-person activity. Now that we “talk” electronically, the skills of personal communication – of talking face-to-face and making other people listen – is quietly dying. So what’s wrong with that? We’re all quite pleased with the new ability to get our messages across fast and easy, with us in total control and no waiting. Uh oh. Who’s willing to sit still and listen while you just talk, these days? That’s seen as a retro, boring, time-wasting format. We’re the Google generation- we get information instantly, on our own. No waiting! Plus–since the number oone motivation for anything we do is self-interest–how will you handle the inevitable roadblock anyone puts up when you ask for attention–“Why should I listen to this? What’s in it for me? Major challenges. So what’s the secret to getting and keeping any listener-audience of one or many today. Know your audience! Start with that “Me First” factor. Otherwise you’ll never be able to get past that inevitable roadblock they put up – their “Why should I listen to this? What’s in it for me?” attitude, and you’ll lose them at the start. Here’s how you do this: The number one human motivation for doing anything has always been, and still is, self-interest. That means we all have a “Me First” factor. To satisfy that, you must focus on your audience’s main concerns – what are their needs, fears, goals—before you satisfy your own. Who’s your audience (of one or many)? What do he/she/ they care most about right now? How much do they already know about your subject? How and why can your pitch or presentation actually help, interest or intrigue them? How can you best show and tell that? Plus one more: What do they expect you to say – something you want to avoid at all costs or you’ll lose them. Just think about today’s issues. You know them. And focus on our common fears. Those answers will come clear to you pretty quickly. Then get more specific for each group as you think about their special issues and problems. Answering those questions — hitting your audience’s buttons and connecting what you want with what they care about– becomes the basis for how you organize your presentation. Their concerns become your opening- the lasso you throw out to catch them and hang on to them as you develop your theme and explain what you want to tell them. So, the secret to making anyone listen is – reach out to them with what they care about, first. Then include yourself and what you want. An Emmy Award winning TV journalist and pioneer in the field of courtroom communication, I coach and lecture worldwide on How to Talk So People Listen, Connecting in Today's Workplace. Click here to hear verbal and visual communication expert Sonya Hamlin speak on the topic of meaningful communication.